GreenOak Real Estate Advisors and Rising Realty Partners Buy Historic 287k sf Office Building in Downtown L.A.
GreenOak Real Estate Advisors, in a venture with Rising Realty Partners, recently acquired The CalEdison, an iconic 287.6k sf, 14-story office building at 601 W 5th St in Downtown Los Angeles. The property was sold by Hermes Investment Management and Lionstone Investments in a deal said to be worth around $140 mil. The 14-story, LEED Platinum building is located at the corner of 5th and Grand, situated near Grand Central Market, The Broad, several Class A hotels and The Grand, a major multi-phased, multi-use master-planned lifestyle development on Grand Ave and 2nd Street. 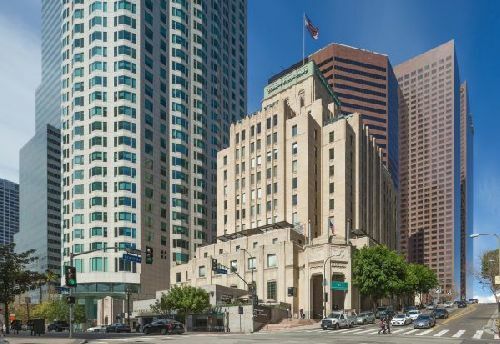 Built in 1931 as the headquarters for the Southern California Edison Company, the building has 30-foot coffered lobby ceilings and highly-detailed Art Deco marble and tile finishes and is situated in one of the most popular creative office locations for tenants in DTLA. Steve Collins, Paul Spellman and Tom Bohlinger with JLL represented the seller in the deal. JLL’s Paul Spellman and Reid McGlamery led the team securing acquisition financing of $111 mil for the buyers. The floating rate loan was secured through a U.S.-based private lender. “This historic building is in one of the most prominent locations in DTLA and is close to two major transit hubs. In addition to its excellent location it is one of the finest examples of Art Deco architecture in the area,” noted Bohlinger.